Nothing rejuvenates or improves a person’s looks more than a bright, straight smile. A new smile can also be a life changer. 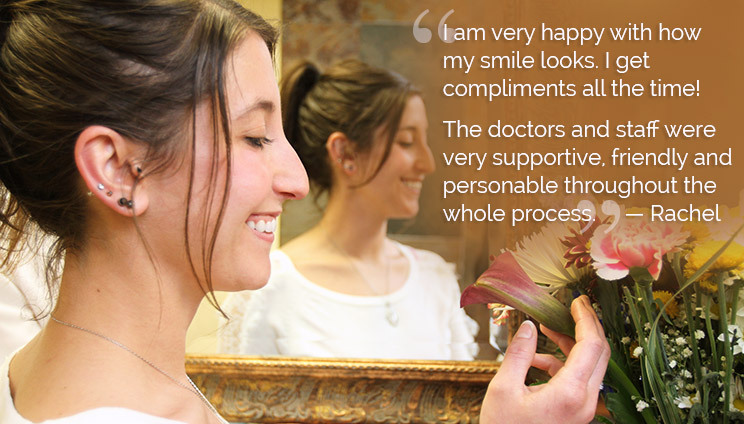 Many of our smile makeover patients report that they have more confidence and smile a lot more than they used to! Cosmetic Dentistry is the art of repairing, whitening or aligning teeth so that they look esthetic. It uses many of the tools of general dentistry, only the emphasis is on creating a beautiful smile. Our doctors are very experienced and knowledgeable in the different tools of cosmetic dentistry and between them have helped thousand of patients have esthetic new smiles. 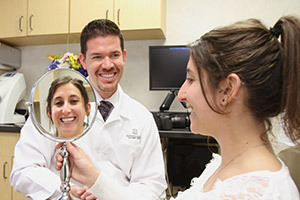 Dr. Noveck and Dr. Nosti have been named Top Dentists in New Jersey. Both Dr. Milt Noveck and Dr. John Nosti have been named Top Dentists in New Jersey for several years in a row through 2014. Their cosmetic work is used in publications and lectures by dental groups to illustrate how a cosmetic case should be done. Dr. Nosti’s porcelain veneer work is used in the American Dental Association’s brochures; and Dr. Noveck’s complex cosmetic rehabilitative work is featured by a top dental educator in lectures to dentists and lab owners in the U.S., Canada and Europe. Dr. Nosti also delivers continuing education courses on various topics, including cosmetic dentistry. He has earned a fellowship in Cosmetic Dentistry from The Academy of Comprehensive Esthetics. Both doctors have completed multiple courses on cosmetic dentistry with some of the greats in the field. Due to their mastery in smile makeovers, they receive patient referrals from other dentists as well as being asked to do the cosmetic work on dentists’ own smiles. Your first step to a brand new smile is a consultation with one of our doctors. They will do an evaluation of your smile and discuss what you would like to change about it. 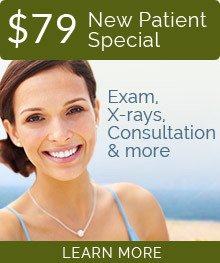 You can receive a cosmetic consultation as part of our $79 New Patient Special Offer. This is an internet only special offer. A new smile in a visit or two! Not everyone needs a complex smile makeover. Sometimes simple tooth bleaching will create the desired effect. Porcelain veneers on the front teeth can, in just two visits, correct several issues at once, such as gaps, crookedness and stained, yellowed teeth. Books with before and after photos help our patients choose a new smile. There is no one solution for all cases. Every case requires its own specific attention. We get to know you and find out what you would like to change about your smile, discussing your overall goals and budget needs. External photos help us plan procedures. Although the focus of cosmetic dentistry is the esthetics of your smile, it’s just as important to ensure that your teeth and gums are healthy, and that your smile is comfortable, i.e. that your bite is correct and that your jaw joint is healthy. This approach ensures a healthy, beautiful smile that can last your lifetime. 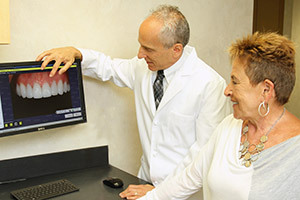 Our doctors use digital imaging to show patients how their smile can improve. Electronic bite check with our high-tech T-Scan® device. With this technology we can see how your teeth are coming together and if we need to fix your bite. TMJ check —we’ll see if you have any jaw joint issues. 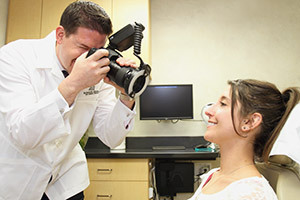 Study models show patients how their new smile will look. Selection of the color and shape of veneers or crowns. We have books of before and after photos to help guide your choice. Before treatment begins you will be shown a mock-up of your smile for your approval. Invisalign clear aligners, Six Month Smiles or SmartMoves braces will close the gap. For a fast fix, we use porcelain veneers or crowns. Our soft-tissue lasers can gently remove excess gum and straighten out a gum line. Dr. Nosti has at hand several orthodontic methods to straighten your crooked teeth, all of which are virtually invisible. Mild cases can also be quickly straightened with porcelain veneers. “Dr. Nosti has literally transformed my life. 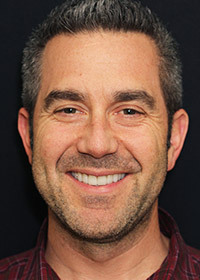 I have looked back at photographs taken prior to having my smile makeover done by Dr. Nosti, and what I notice most is that my smile never appeared to be a full-hearted grin. Now I smile with confidence and make every effort to show my teeth as much as possible.